This gift box has a length of about 9.5 in, a width of about 4.5 in and has a height of about 2 in. Salted Colossal California Pistachios: Pistachios, Salt. They are very good, but not that much bigger than other pistachios I've had. A Christmas gift for our sister "the vegan"
She loved them, they were gone long before Christmas! The pistachios were very good and were large but I think overpriced. I expanded your Pistachios as a gift to other people this year. 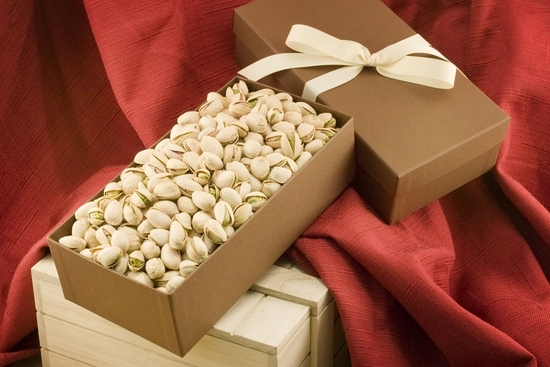 I've always sent your Colossal California Pistachios to my father as a gift. Every year he raves about how good they are. This year I decided to give them as a gift to a fellow team mate at work (hoping I might get a few). I wasn't disappointed. My father was right about the size and how good they tasted. My friend and his grandson ate the whole 1lb gift box that night watching a basketball game. I ordered these Pistachios on a Monday to be delivered on a Wednesday...and they made it just in time for my grandmother's 85th birthday! She threatened us not to get her flowers again this year and we decided to send her favorite, nuts. She said the package arrived and it was "beautiful" and that the nuts were fresh and delicious! We will probably start sending Grandma nuts every year now so she can enjoy them much more than flowers! Sent these as a gift and got a call right away how much our friend loved them! He loved them and he eats A LOT of pistachios!